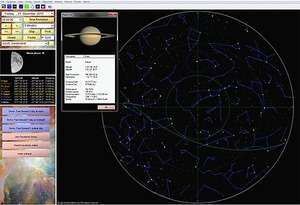 Async Planetarium provides desktop users with a view of over 2500 different stars and literally hundreds of different constellations and other celestial bodies. Planetarium also gives you a view of what the sky looked like hundreds of years ago and what it might look like at a specific date in the future. The application allows you to change your position and point of observation but inputting latitude and longitude coordinates; you may also change the time of the day easily which in turn changes the perspective. Highly advanced and extremely curious. Version 2.80 is a freeware program which does not have restrictions and it's free so it doesn't cost anything. For security reasons, you should also check out the Asynx Planetarium download at LO4D.com which includes virus and malware tests. Additional screenshots of this application download may be available, too. Asynx Planetarium has a presence on social networks.